It is with renewed pleasure that I welcome you as Mayor with all elected. You are more likely to respond to this invitation, I rejoice because this is an opportunity for me to build a close relationship and a dialogue with all the residents but also to return to the events of the past year and expose you upcoming projects. Over the month, it is clear that the current Mayor mandate is more difficult than the previous. skill transfers imposed in favor of the Intercommunity and ousting the Mayor. A decrease in depreciation and uncertainties as to the complexity of removing the housing tax. Paradoxically, the Mayor's responsibilities increase and expectations of the people are great but Mayor can not do everything. Also, we have to make choices and prioritize our projects. Gabin ARCADE, Jules CALENGE, Célian COUSIN-MAURIZOT, Tom DEFENOUILLERE, novels DUREL, Marilou FILMONT, Eliott GAILLARD Soluna GIROUARD, Leo HARNOIS, Antoine HOUCHARD, Anouk LEBOUCHER, Alicia LECOQ ,Alois LEMEILLE, Maël MAZIER, Anatole MIRANDAY, Anaïs MONTHULE,Quentin POBANZ, Maïwen NOVEL, Gabriel PAIN, SKOWERA Théo. The mayor or deputy take a permanently Wednesday 17 h 30 with 19 h and Saturday 10 h 12 h to respond to your requests and jot your comments. Continuously every working Tuesdays 10 h 12 h. Catherine Decotignie. In connection with the CCAS and social workers. 8 h 30 with 12 h et de 14 h 30 with 19 h 30 Monday to Friday. 9 h 12 h et de 15 h 19 pm Saturday. 9 h 12 pm on Sundays and holidays. The permanent or occasional use of all-terrain vehicles thermal engine (motorcycles, quads…) personally on private land must not disturb the tranquility of the neighborhood. Pet owners and keepers of animals, especially dogs, are required to take all necessary measures to avoid nuisance to neighbors, including the use of devices deter animals make noise repeatedly and untimely (dressage, collier anti-aboiement,…). 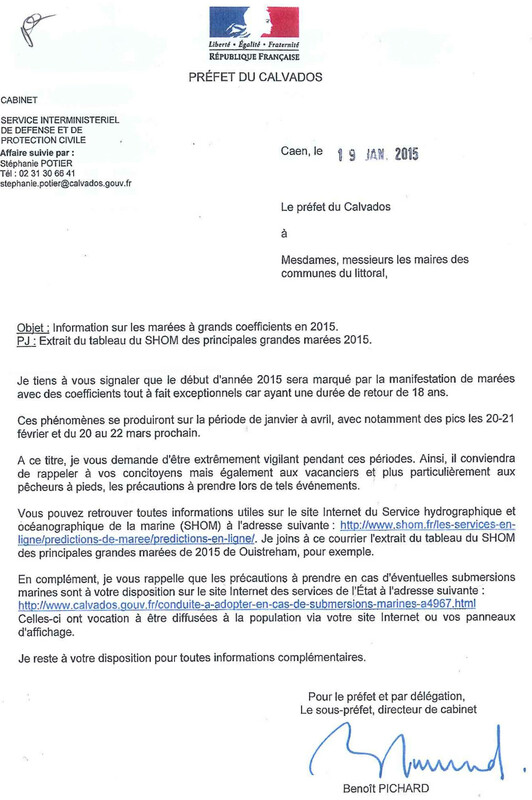 The deployment of Linky meters began on December 1 2015 Caen. From here 2021, 35 million meters will be replaced in France which 430 000 counters in the department. Nowadays, over 2000 Linky meters have already been installed. The Linky meter is a new generation of electric meter. It can receive commands and send data without the intervention of a technician. All individual, professional and business is affected by the Linky meter replacement. Each person will receive a letter from ERDF 30 and 45 days before the date of installation. The paving company commissioned by ERDF inform the customer of its passage 25 days before that date. Neither the Linky meter, nor its installation may be canceled. Individuals may be present on behalf of ERDF canvass for you at your home, by telephone, by mail or SMS. Refuse any payment, no service offer will be proposed at this facility by ERDF. Need information ? On the advice of Linky ? Tuesday from 10 am to 12 pm. In any case your doctor or doctors on call can not be reached, a "Health Watch is available" by the 15. Communities (town, intercom, union) are there to provide the service, l'information, Council. in yellow bags (collection of Tuesday morning): plastic packaging, alu, cardboard and paper (advertising, newspapers, journals,…). These yellow bags are available at the town hall during opening hours and Saturday morning to hotlines elected. For information on the rules and organization of waste collection, you can contact the community of communes Earth, Seulles et More to 02 31 77 72 76.  lamps (tubes fluorescents, low energy lamps, LED lamps ...) except filament lamps. A question ... a question ? REMINDER : electrical and electronic waste as well as the tires, paints and toxic waste (pesticides, cells, neon lights ....) are not collected with bulky. These can be deposited in waste. – Thursday 17 October 2019. Address : ZI Sud activity – CREULLY. To get to the dump, you should bring your map Seroc (1era of application or renewal to the town hall). Monday, Tuesday, jeudi a vendredi de 14 h. with 18 h.
mercredi a samedi the 9 h. with 12 h. and 14 h. with 18 h.
Winter hours: closure 17 h.
Household Waste’ October 15 June 2019. Monday : Garbage (black bags). Thank you out the only bags the night before. All French youth who have reached the age of 16 years (girls and boys) must be spontaneously identify with the mayor of their home. This formality is mandatory to attend competitions and public examinations (whose license) before the age of 25 years. Young French birth must be enrolled between the day of their 16 years and the last day of the third month following the month of the anniversary. Young became French between 16 and 25 years must be enrolled in the months following the acquisition of French nationality Date. If the deadlines have passed, However, it is possible to rectify the situation until the age of 25 years following the same way as a traditional census. If major, he must approach alone. In the census, must be present with identification (national identity card, passport or any other document proving the French nationality) and the family book. Following the census, the mayor issue a certificate of census. No duplicate will be issued. This certificate must be kept carefully. In cas near or vol, it is possible to request a receipt at the office of national service you depend. The census allows the administration to convene for the young defense that carried the day and citizenship. According to the census, it is necessary to inform the military authorities of any change in circumstances. If no census on time, you are irregularities. For details, you can make an appointment at 02 31 22 20 33 with M. Chanal, Deputy Mayor and Defense Correspondent of the Municipality.